Are you looking for backyard garden designs for your home, but not sure where to start? 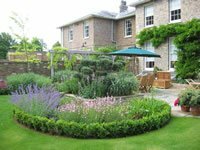 Many people want a yard that their friends and neighbors would be envious of, but not everyone is a professional gardener or has the “knack”. People go to college for years to learn how to design award winning landscapes. Here are a few things to consider when planning your design. Size Matters! : No, this isn’t a joke or a metaphor, the size of your garden design is very important. Some of the best backyard landscape design ideas are the ones that fit the space they were intended for. Don’t try to bite off more than you can chew. When you have a large amount of space to fill, the tendency is to take the easy way out and try to cover as much ground as possible with the least amount of work. Pace yourself! Award-winning gardens are not grown overnight. Don’t be afraid to break up your space into manageable sizes. Nothing looks worse than a garden that seems as if it was thrown together haphazardly. Take some time and think the design through and work through your backyard garden designs in pieces, you’ll be amazed at how well the puzzle will come together in the end, if you just chip away at it little by little. This is another rookie mistake a lot of new gardeners make. It is very common for folks to simply throw plants at a barren space and hope for the best. Most often the result is not what they were hoping for. You don’t have to be a master gardener to come up with a simple plan. When you look at the space you have to work with, chances are you have endless backyard garden designs that you could try. Start off with your favorites, or your “must haves”! By creating focal points and themes throughout your garden, you can create rooms in which a visitor can move through as they explore. The focal points need not be elaborate or complicated either. Sometimes an arbor or a garden bench will do in small gardens, or perhaps a statue or a water feature. Or if you are dealing with a large space, a tree or structure will work nicely. 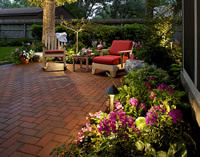 All you need is something to build around and tie your backyard landscape design ideas together. Find the focal point of a particular space, and build your design around that. It’s much more pleasing to the eye when one can understand the motivation of a particular garden. It’s extremely easy to get hung up on the symmetry of a garden, but it is also one of the hardest aspects to maintain. Symmetry is OK if you’re talking about potted plants on a doorstep, or hanging baskets around your porch, but it doesn't always work in gardens. It takes an awful lot of work to maintain symmetry among plants, and what do you do if one of your plants dies? Will you be able to find the right match, do you need to replace both to keep things even? Don’t worry about it. Plants don’t generally grow symmetrical in nature, so don’t try to reinvent the wheel. Take your backyard garden designs and focus on their end goal. Are you looking for a lot of blooms, or are you looking for foliage and texture? Are you looking for a garden with a koi pond, or are you looking for a relaxing shade garden to waste away a few summer afternoons? These are the choices that will ultimately determine if your landscaping ideas will look right in the end. Don’t spend a lot of time worrying if one plant doesn't precisely line up with another. 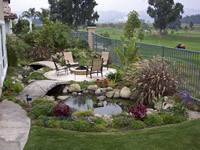 All of the backyard landscape design ideas you have all come down to the same question, what plants to put in it. Now this may seem like a flippant remark, but think about it…how much thought do you really put into the plants you choose when you go to your local nursery or garden center? Do you just buy the ones with the prettiest flowers, or the richest foliage, or do you go shopping with a plan in mind? Most purchases are made spur of the moment, by whatever catches ones eye at the time. The best looking plants at the nursery however, may not be the right plants to go into your garden. Don’t be afraid to take your time and put some extra thought into it. While some of the best backyard landscape design ideas are built “on the fly”, don’t underestimate the value of a good plan. Before you rush to buy something that catches your fancy, find out how big the plant will be when it reaches maturity. You don’t want to plant things too close to it and have to prune it back prematurely. Find out how fast the plant grows, and compare it to the rest of the selections in your garden. The last thing you want is a couple plants racing to the finish line while the rest of the garden is still in its infancy. Time spent choosing the right plants from the get go will save you a lot of aggravation in the long run. Keep it Simple: Everyone wants a professional looking garden, but sometimes we tend to over-complicate things and make them harder than they need to be. It’s human nature. If you find yourself getting overwhelmed with one of your backyard landscape design ideas, take a step back, and a deep breath, and ask yourself what the most important part of the design really is. It’s not unusual for one to lose sight of the bigger picture, while focusing on the details. Leave the lavish gardens to the rich and famous who can afford to maintain them. Most of us live in the real world where the last thing we think about in a tough economy is the garden. Great things can happen with small dreams, and you don’t need to spend thousands of dollars to have a dream garden.